Dr. Priyanka Basu graduated with Bachelors in Dental Science in the year 2011 from Bapuji Dental College and hospital, Karnataka. She persued her masters in Orthodontics and Dentofacial Orthopedics from A B Shetty Memorial Institute of Dental Sciences, Mangalore in 2012. 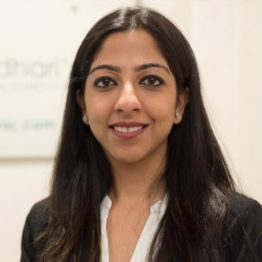 She is affiliated with the Indian Orthodontic Society (IOS) and Indian Dental Association (IDA) and takes keen interest in updating herself from time to time by attending CDE programs, conferences and workshops. She has been actively involved in national oral health programs and camps. She has a number of publications to her credit that include ‘Two phase orthodontic treatment ’, ‘Retention in orthodontics- a review’ and ‘Temporo mandibular disorders (TMDs) and orthodontics: a review ‘She has spoken widely in national conferences and conventions on a number of topics like, -Class 3 maxillary corrector- cephalometric analysis of maxillary protraction with intermaxillary elastics attached from miniplates to bonded rapid maxillary expander, 18th IOS PG Convention, Meerut ,UP. -Esthetically yours – the Invisalign technique, IDA KSDC, Coorg, Karnataka. -Tandem traction bow appliance –class 3 correction, 17th IOS PG Convention , Mangalore, Karnataka. -“ALT-RAMEC”– Shake It To Break It. 49th Asia Pacific Orthodontic conference (APOC). Although she enjoys all aspects of dentistry and providing the best treatment to her patients, she holds orthodontics close to her heart and enjoys treating both young and adult patients. Starting from preventive and corrective orthodontic treatment with braces and other corrective appliances to treating adult orthodontic patients with highly aesthetic clear aligners (invisible braces) .Her love for kids is visible in the way she attends to them and instantly comforts them with her fun pep talks.